In addition to the attributes of the individual minerals, tiger iron is strongly grounding, strengthening our connection with the Earth. With feet on the earth and head no longer in the clouds, we think more clearly, and are able to find solutions to problems that once appeared unsolvable. Tiger iron strengthens resolve, and the desire to move forward with projects, even turning dreams into reality, and carries the warrior energy of hematite with the femininity of red jasper, giving us a balanced approach to our goals. Physically, tiger iron improves the blood, so can be used in treating anaemia and circulatory problems. 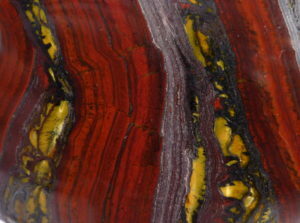 A banded ironstone rock; a metamorphic fusing of hematite, red jasper and gold tiger’s eye.